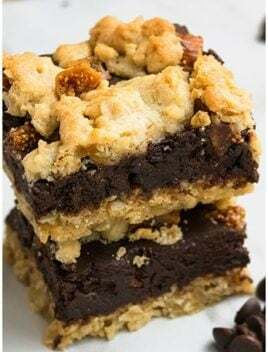 Easy chocolate oatmeal bars recipe, also known as chocolate crumb bars, made with simple ingredients. They are rich and fudgy and have a chewy texture. 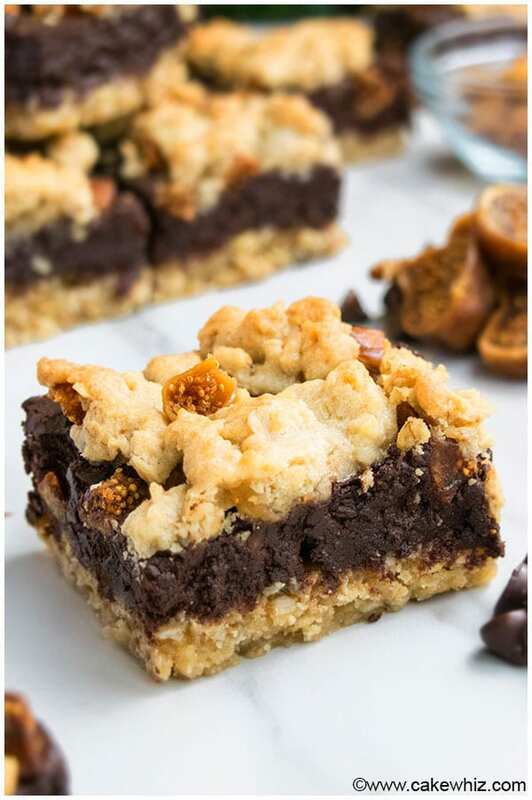 I am sure many of you have tried chocolate oatmeal bars or chocolate crumb bars from bakeries but have you ever made them at home? They are surprisingly SIMPLE to make and you don’t have to pay $4.50 a slice…Yay! Over the years, I have slightly MODIFIED my family’s basic recipe to make oatmeal bars with fruit filling, bananas, honey, peanut butter, jams and preserves but these soft and chewy oatmeal bars are still my FAVORITE, hands down! I have a recipe for BAKED oatmeal bars and a recipe for NO BAKE oatmeal bars and they are both really good but I grew up eating this baked version and like them the BEST. So many layers of deliciousness… Oh my! A batch barely lasts a day at our house and after you eat once slice, you will be coming back for another one and another one and another one…lol. Imagine the flavor of classic chocolate oatmeal cookies and TRANSFORM that vision into oatmeal cookie bars but a million times better! Just be sure to have a big glass of milk handy coz these bars are RICH! The best part about these bars is that NO MIXER is needed…You just need a spatula! Also, in case you are wondering, these are NOT healthy oatmeal breakfast bars… these are meant to be eaten as dessert or an INDULGENT snack. These Homemade Granola Bars Recipe (Peanut Butter Granola Bars) are probably more suitable for breakfast for kids and adults. I used Sun- Maid’s California Calimyrna Figs this time and that truly enhanced the wonderful chewy texture of these simple oatmeal bars. 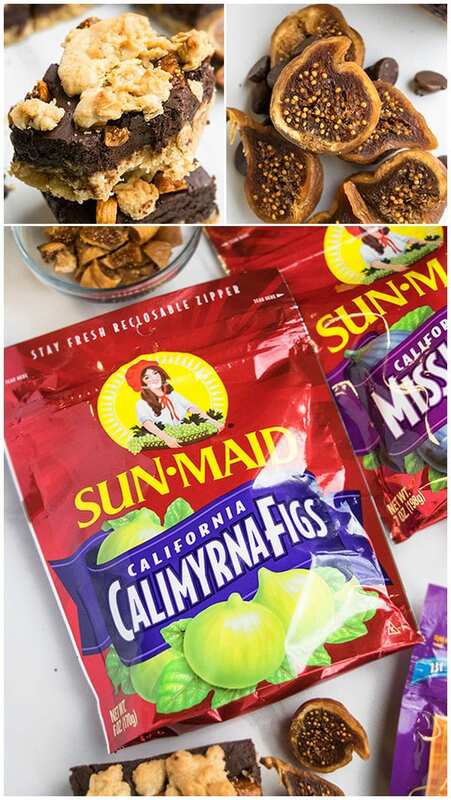 You can also use Sun- Maid California Mission Figs or Blue Ribbon Orchard Choice Mission Figlets BUT Sun-Maid California Calimyrna Figs figs look the best and I personally like their flavor and texture the best in baking. I also used Rodelle Vanilla extract in this recipe because their extract seriously rocks and trust me, not all extracts are the same. Some are far superior (e.g. Rodelle!). I use it a lot in my baking, especially holiday baking. Their flavor and fragrance is EXCEPTIONAL! Use the BEST quality ingredients you can find. Your recipe is only as good as the ingredients you use. You must line the pan with aluminum foil and oil it very well OR use good quality parchment paper to prevent the batter from sticking to the pan. To make smooth and even slices, cover pan with foil paper or saran wrap and CHILL in the fridge for 2 hours. I used a square pan to cut squares but you can use a round pan and cut triangular slices, if you like. DON’T replace all-purpose flour with whole what flour or any other type of flour since the texture will change dramatically. Old fashioned oats MUST be used instead of quick cooking oats. DON’T replace butter with oil or shortening because butters adds so much richness to these bars. The amount of figs can be ADJUSTED, based on your preference. I use quite a bit because I like them a lot. DON’T replace sugar with honey or molasses because it does not work well in this recipe. DON’T replace sweetened condensed milk with evaporated milk or whole milk because that will make the chocolate mixture very thin and runny, which does not yield the best fudge layer. Be sure to press down the oat mixture tightly because that allows the bars to hold their shape together very well. To make peanut butter oatmeal bars recipe, add 1/4 cup melted peanut butter in the oatmeal mixture. Also, replace figs with 1/3 cup peanut butter chips. 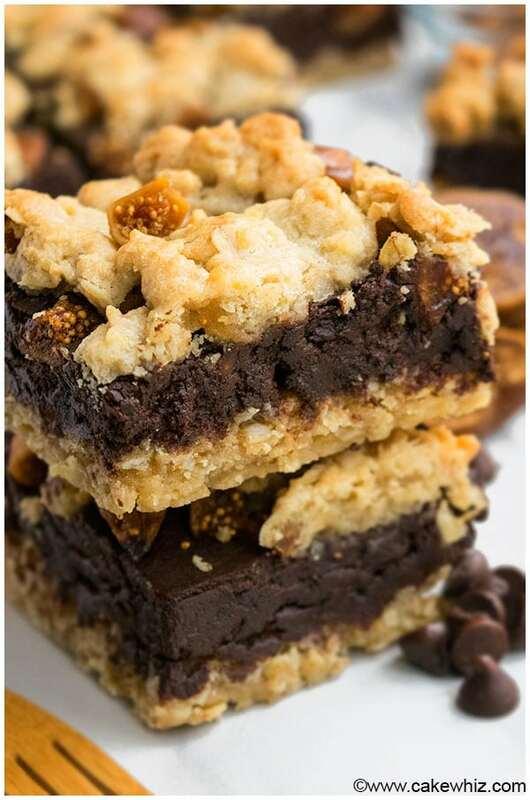 Toss them on top of the chocolate fudge layer along with a drizzle of 2 tbsp melted peanut butter. 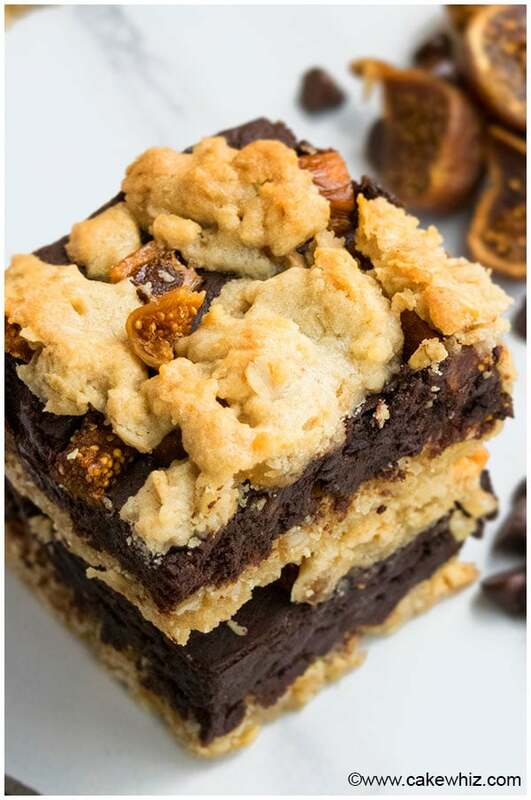 To make chocolate chip oatmeal bars, replace chopped figs with 1/3 cup chocolate chips. Toss them on top of the chocolate fudge layer and press them down with a spatula. How do you make oatmeal bars? Start off by preparing the oatmeal layer by mixing together butter, granulated sugar brown sugar, egg, vanilla extract, flour, oats. Spread this mixture in a square pan but be sure to reserve one third of the mixture for the top. In another mixing bowl, add chocolate chips, butter and condensed milk. Heat in the microwave and mix everything until smooth. Pour this mixture on top of the oatmeal layer. Toss some chopped figs. Pour spoonfuls of remaining oatmeal mixture on top of the figs. Bake and enjoy! Can you freeze oatmeal bars? Yes, you can freeze them. Once they have fully cooled down, cut slices and wrap individual slices in saran wrap. Place them in a sealed freezer bag. When you are ready to eat them, remove them from the freezer and place them at room temperature until they thaw and enjoy! If you are fond of figs as much as me, be sure to check out many other fig recipes on the Valley Fig Growers website. 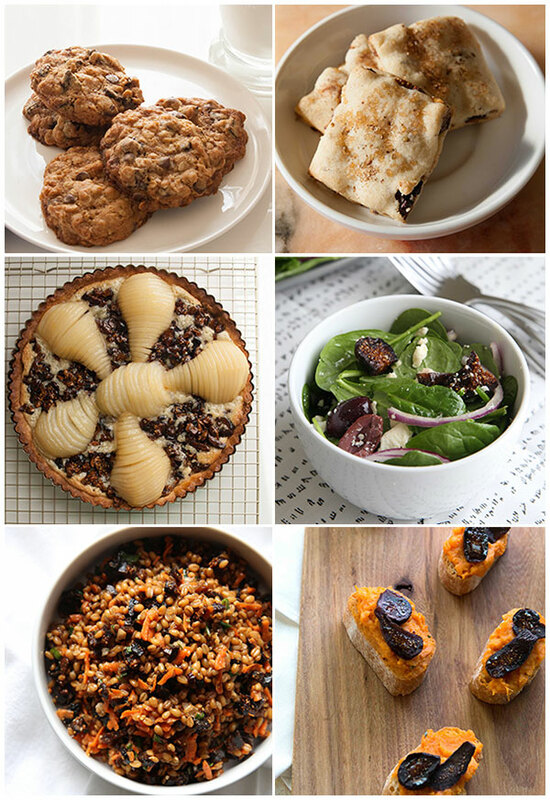 Seriously, how good do these cookies look or even that tart?! Mmmmmmm! In a large mixing bowl, add butter, vanilla, egg and mix everything together. Add granulated sugar and brown sugar and mix again. Add oats and mix until until you have a thick lumpy mixture. Spread this mixture in a square pan (Dimensions: 8x8), lined with foil paper and sprayed with oil or lined with high quality wax paper. BE SURE TO RESERVE A THIRD OF THE MIXTURE FOR THE TOP. Use a spatula to spread out the batter evenly and press it down tightly. Keep aside. In a separate bowl, add chocolate chips, butter, condensed milk. Heat in the microwave and mix until mixture is smooth. Pour this chocolate mixture on top of the oatmeal layer and spread it out evenly with a spatula. Stick chopped figs on top of this chocolate layer. Spoon reserved oatmeal mixture randomly on top of the figs but don't spread it out. Bake at 350 degrees for 23-25 minutes OR until oatmeal mixture is golden brown on top. Enjoy! Leftovers can be stored at room temperature in a sealed container for up to 2 days. Chilling in the fridge makes it easier to cut perfect smooth slices. I love the idea of figs in this!